Nestled in the woods, Joe's House is the realization of a teenage boy's dream treehouse. As part of a larger compound with shared services, the building needed only to provide the basic requirements of daily living. 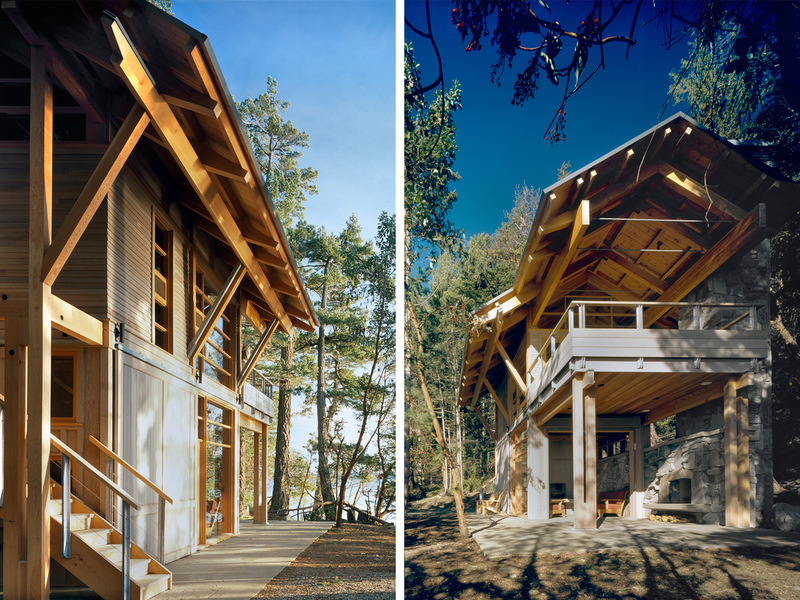 This private getaway has a minimal footprint, but rises up among the trees of the site. Its verticality allows access into the tree canopy and provides a view out to the water. The interior floor area is only 500 square feet (46 square metres), but the end walls on both floors open up entirely, creating seamless indoor/outdoor spaces. Upstairs, the bedroom literally rolls out onto the deck with a bed on tracks for sleeping under the stars. Downstairs, the living room spills out to a covered patio, allowing for a protected experience of the site extending far beyond the boundaries of the building footprint.